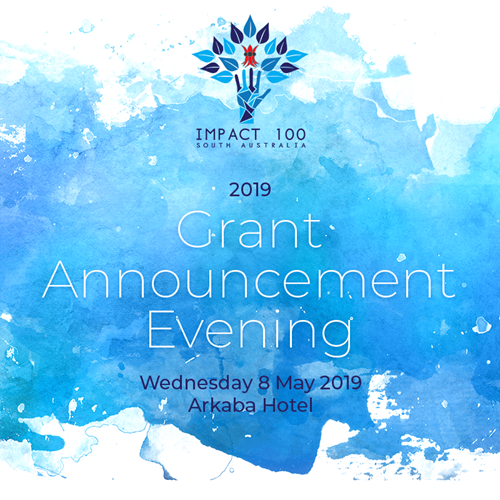 You and your partner/guest are invited to the Impact 100 SA 2019 Grants Award Night, to be held at the Arkaba Hotel, on Wednesday 8th May. The four grant finalists will make their final presentations, before members cast their vote to help bring two of these transformational projects to life through TWO $100,000 high impact grants. We will also hear from the two 2018 winners, Operation Flinders and Puddle Jumpers, who will share how they have utilised their grant. Channel Seven news presenter and Impact100 SA ambassador Jane Doyle will interview our 2018 winners, Operation Flinders and Puddle Jumpers about how they have utilised their grant. Guests will be treated to performances throughout the night by Adelaide’s Big Band’s vocal guitar duo, jazz quartet and vocal jazz quintet, in addition to two performances from the Big Band and the night will be attended by the Governor, His Excellency the Honourable Hieu Van Le and Mrs Lan Le. Drinks, canapés and a grazing cheese and fruit buffet will be offered throughout the evening. Membership growth will ensure the sustainability of Impact100 SA so we encourage you to take the opportunity to bring like-minded guests, as this will be a great showcase to encourage them to join.